"Ben! You got a letter from Santa," I said, arriving home on Christmas Eve. The letter was sticking out of the mailbox just waiting to be hand-delivered to Mr. Benjamin. He excitedly grabbed it from me and made quick work of ripping open the envelope and extracting the message, printed on Christmas theme paper with a hand-written postscript dangling at the bottom. "Let me read it to you," he said, face beaming, expectant, excited. "Dear Friend," he began, holding the letter carefully in his hands, reading slowly and carefully. "I was so thrilled to receive your letter. As you can imagine, we are very, very busy here at the North Pole." "The big news," he continued "is that we decided to make Santa's workshop larger. Last year the elves simply didn't have enough space to work and play. We finally decided that something had to be done when one elf accidentally bumped into another and dropped a huge bag of marbles on the floor. Just picture it...dozens of elves spinning their little arms around trying to keep from falling down. They looked like tiny dancing windmills! Now we have a fun new dance at the North Pole-the windmill dance." "The reminds me," he read on. 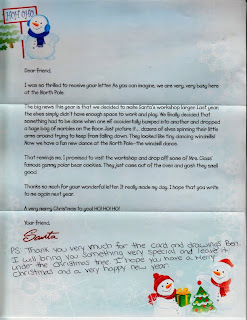 "I promised to visit the workshop and drop off some of Mrs. Claus' famous gummy polar bear cookies. They just came out of the oven and gosh they smell. good." "Thanks so much for your wonderful letter. It really made my day. I hope that you write to me again next year." "A very merry Christmas to you! Ho! Ho! Ho!" "He added a hand-written note Papa." "Thank you very much for the card and drawings Ben. I will bring you something very special and leave it under the Christmas tree. I hope you have a merry Christmas and a very happy new year." He smiled and sighed, cheeks red, eyes wide open. Merry Christmas and many blessings to the wonderful volunteers at Canada Post for keeping the magic of the season alive with their selfless efforts on behalf of St. Nicholas. We are grateful for all you do.